Everyone loves a kei-truck, right? Or maybe not everyone, but I do. After all, my Tomica obsession started with a Subaru Sambar. 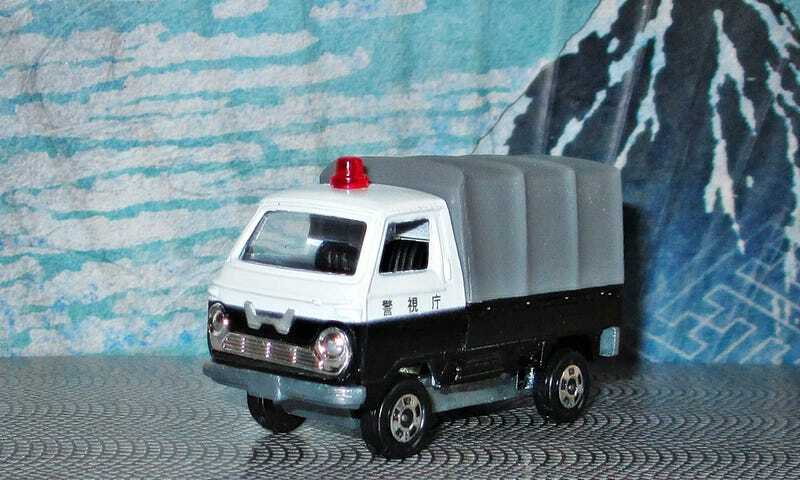 But this was Tomica’s first kei-truck - the Honda TN360. The TN360 was Honda’s second small truck, following in the footsteps of the previous T360 model. It was produced from 1967 to 1977. The TN360 uses an air-cooled two-cylinder 354 cc engine with a single overhead camshaft, and was adapted from the Honda CB450 motorcycle. The preceding T360 had been equipped with a very complex twin-cam four-cylinder unit, whereas this new engine (shared with the N360 sedan) was more suitable for mass production. The engine was redesigned to be mounted horizontally, residing midships beneath the load floor. Output was 30 PS (22 kW) at a dizzying 8,000 rpm, torque came in at 29 N⋅m at 5,500 rpm - you had to rev that baby. Tomica first made the pick-up version in 1971 - it became the first #18 in the Tomica line-up. Pepsi Truck and Post Van versions also followed in that same year. These old versions are still very popular among collectors, and can be expensive if you insist on a mint one with the original black box. The Police version you see here was released much later, around the Year 2000. It was part of a series of Models exclusive to Ito Yokado department stores, which were mainly decorated as Emergency Vehicles, to Police and Fire Dept versions abound. But some race cars and regular models were also in that mix. What’s really unusual about this one is that it was Made In Japan. By the Year 2000, the vast majority of Tomica production had already moved to China. But a few tools had not been moved, and several special releases and Gift Sets remained in production in Japan. One question remains: Was the TN360 actually used by the Police? I doubt it. My image searches only ever turned up Tomica models rather than any pictures of a 1:1. And while the Police in Japan do use kei cars for particular duties, it is hard to imagine what the coppers would do with this mini trucklet. It wouldn’t be for chasing the Akuma No Zetto on the Wangan, that’s for sure.